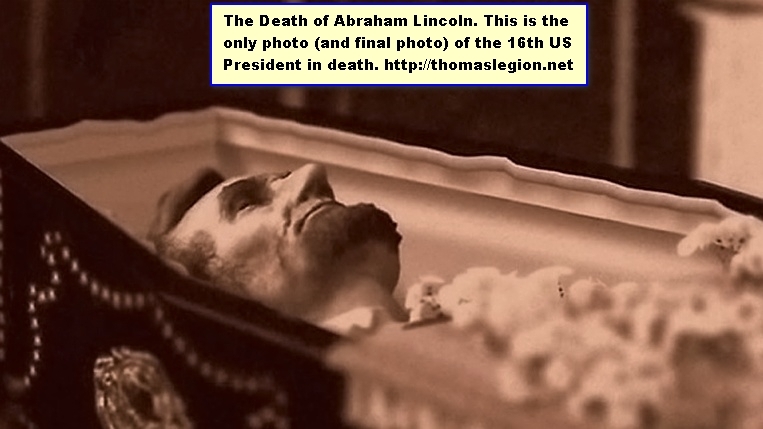 This is the only photo in existence of Abraham Lincoln in death. Abraham Lincoln has had more biographers than any other American president, and, with practically every single volume idolizing and worshipping Lincoln, it is no doubt the number one reason why he is ranked the greatest (or number one) U.S. president in history. Just days after the nation honored the 200th anniversary of Abraham Lincoln’s birth, 65 historians ranked Abraham Lincoln as our nation's best president, while George Washington—yes, one of our Founding Fathers, that great hero of the American Revolution and our first president—settled for a distant second. Now how is that, I asked? It led me to many questions. To most Americans, President Abraham Lincoln is known as Father Abraham, Honest Abe, Lincoln the Great Emancipator, and even Saint Abe. Make no doubt about it, through the ages Abraham Lincoln has been idolized, mythologized and even immortalized. We have been taught in our public school system that Lincoln really was larger than life, that he was a Moses or Jesus figure. Even paintings with angels hovering about the president's head adorn the walls of many Americans. Has anyone ever seen a painting with George Washington surrounded by a multitude of angels? When I lived in England I was schooled on the English view of the American Revolution, or American Rebellion, and those Colonial rebels, and it was a real eye-opener to say the least. But from America’s perspective, it was a revolution for freedom and a rebellion against tyranny, right? Is it possible that both sides were correct? 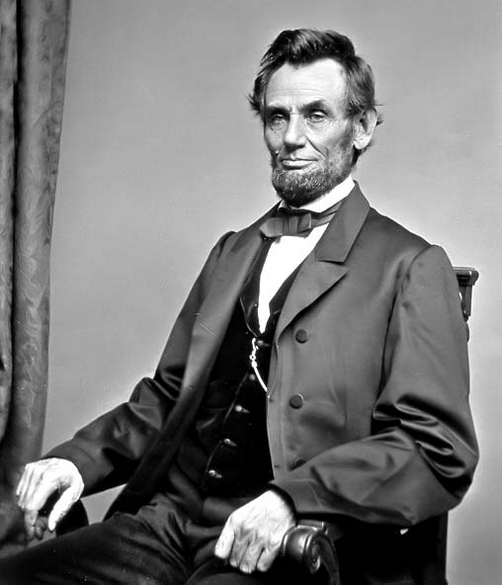 During the American Civil War, the North also referred to the South as rebels and to the war as the War of the Rebellion, but, on the other hand, the South believed it was a second war for independence, a war against tyranny, a war against the tyrant Abraham Lincoln. Could it also be that both sides were correct? (About) Unretouched photo of Lincoln. A district attorney can lead a grand jury in any direction and to any conclusion, and that is why there is a subsequent trial with both the prosecution and defense present. In a marriage, just like in any given divorce, there are two parties involved. In debate, we witness both the affirmative and negative positions. And so there are two sides to the President Abraham Lincoln story. Do we ever read the history that was written by the defeated foe? How many classroom textbooks were written by the defeated and conquered Native Americans? Did you know that most Native Americans rank President Andrew Jackson as the worst president? Do we read Vietnam’s version of the war? They rank President Lyndon Johnson as the worst American president. How many of us have read Mexico’s view regarding the Mexican-American War? Many Mexicans believe that President James Polk was by far the worst president, while many Americans rank Andrew Johnson in the dubious last position. But didn't Johnson inherit Lincoln's mess and the 620,000 that had died and the additional hundreds-of-thousands that had been maimed, crippled and disabled under Lincoln's watch? It was 3% of the total U.S. population, which today would equate to nearly 9,000,000 souls. (That's not including the hundreds-of-thousands of widows and orphans and homeless Americans.) To put it into perspective, 3% of the U.S. population equates to the combined population of the present-day states of New Hampshire, Hawaii, Rhode Island, Montana, Delaware, South Dakota, Alaska, North Dakota, Vermont and Wyoming. 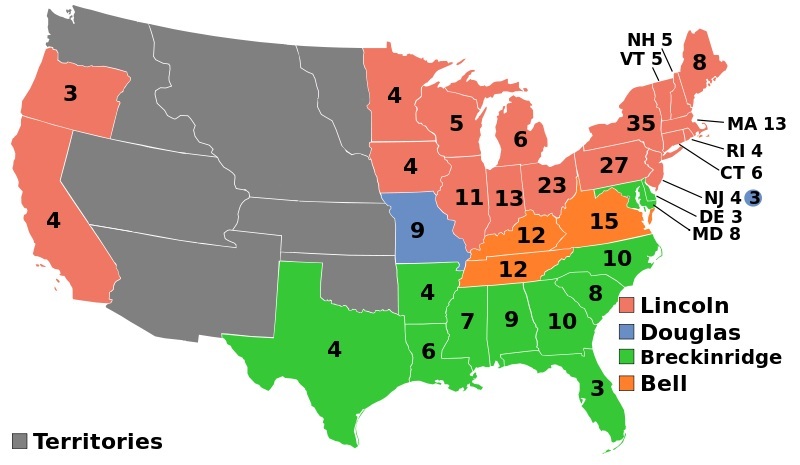 (Above) In the 1860 election, without a single Southern electoral vote and with only 39.8% of the popular vote, Abraham Lincoln became the 16th President of the United States. John Cabell Breckinridge was a U.S. Vice President, the most senior ranking public official to commit treason, cousin to Mary Todd Lincoln, presidential candidate (ran against Abraham Lincoln), and prominent Confederate general. Breckinridge (often misspelled as Breckenridge), furthermore, has witnessed only one full-length biography written about him. 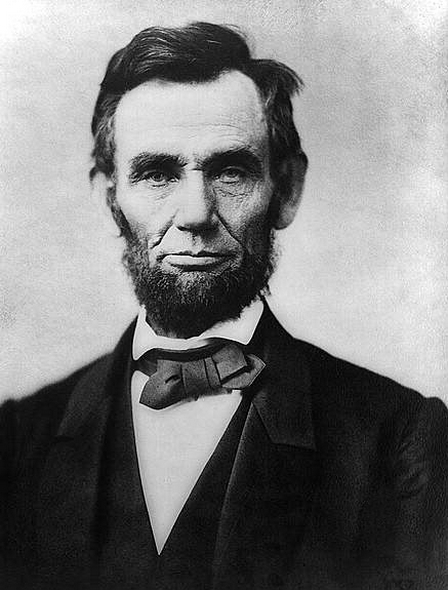 On the other hand, President Abraham Lincoln has been honored with more than 14,000 biographies. The point has been learned from innumerable lessons in history: the victor who writes and teaches its own version of history, presents it with outlandish bias and with utter disdain for the vanquished. We must always remember that there are two sides to the story, and to obtain fairness, balance and objectivity we should lend an ear to each side, and anything less is not history in context, period. The South, consequently, had staunch views and beliefs about Lincoln, and it is only proper that its viewpoints be studied. With more than 14,000 Lincoln biographies, perhaps somewhere in the midst is the real Lincoln. But if you could read one Lincoln biography per day, it would factually take you more than 38 years to read them all. Was Lincoln really the Great Emancipator? Did the Emancipation Proclamation free a single slave? Was Lincoln a racist and white supremacist? Did he really have plans to ship African-Americans to some colony abroad? 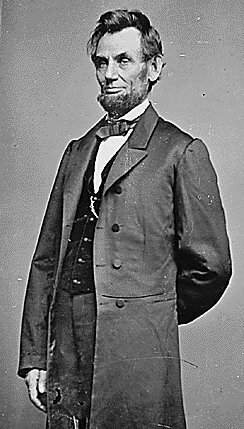 Was Lincoln responsible for the Civil War and its outcome? Were the slaves freed in the middle of the conflict only because Lincoln feared losing the war? Was the emancipation a political decision because England and France would not assist a nation that supported slavery? Did Lincoln trample, trump and trash the U.S. Constitution? Of course it wasn't coined until decades later, but we all know that famous quote: “The buck stops here.” The resources on this page will allow the reader to access the good, the bad, and the ugly regarding our so-called greatest president. 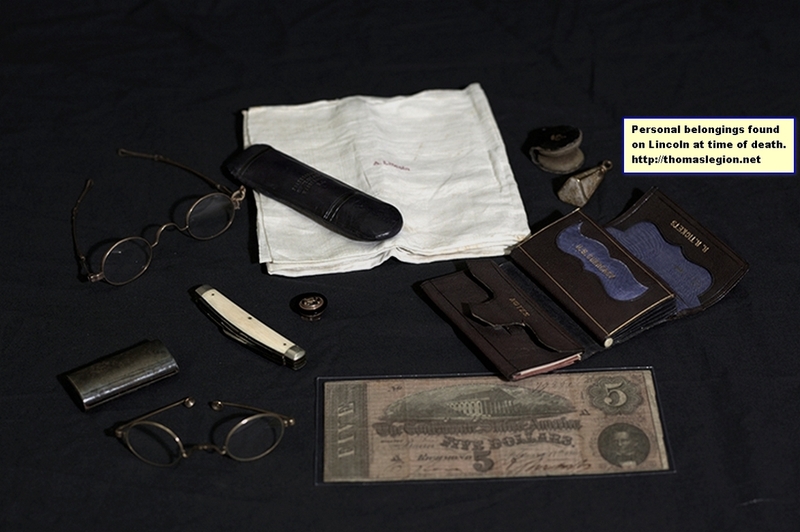 When Abraham Lincoln was shot at Ford’s Theatre in Washington, D.C., on April 14, 1865, he was carrying two pairs of spectacles and a lens polisher, a pocketknife, a watch fob, a linen handkerchief, and a brown leather wallet containing a five-dollar Confederate note and eight newspaper clippings, including several favorable to the president and his policies. Given to his son Robert Todd Lincoln upon Lincoln’s death, these everyday items, which through association with tragedy had become relics, remained with the Lincoln family for more than seventy years. President Abraham Lincoln on Race: What did Lincoln really think about the Black Race? Was Abraham Lincoln a Racist? CNN TalkBack Live transcript of an interview with executive editor emeritus of Ebony magazine, Lerone Bennett, Jr.
President Abraham Lincoln and Southern Secession: Why did the South Secede and what Caused the Civil War? Viewed within the changing contexts of each administration, the Presidency has never seemed more compelling and human. Narrated by Edward Herrmann ("The Aviator"), this three-DVD set is a proud addition to the award-winning documentary tradition of THE HISTORY CHANNEL®. DVD Features: Feature-length Bonus Program "All The Presidents' Wives"; Timeline of U.S. Presidents; Interactive Menus; Scene Selection, and more! By examining both the address and Lincoln in their historical moment and cultural frame, Wills breathes new life into words we thought we knew, and reveals much about a president so mythologized but often misunderstood. Wills shows how Lincoln desired to change the world and…how his words had to and did complete the work of the guns, and how Lincoln wove a spell that has not yet been broken. About the Author: Lerone Bennett Jr. is the executive editor emeritus of Ebony magazine and the author of 10 books, including Before the Mayflower, Great Moments in Black History, Pioneers in Protest, The Shaping of Black America, and What Manner of Man, a biography of Martin Luther King. He lives in Chicago. Through meticulous research of the newly completed Lincoln Legal Papers, as well as of recently discovered letters and photographs, White provides a portrait of Lincoln’s personal, political, and moral evolution. White shows us Lincoln as a man who would leave a trail of thoughts in his wake, jotting ideas on scraps of paper and filing them in his top hat or the bottom drawer of his desk; a country lawyer who asked questions in order to figure out his own thinking on an issue, as much as to argue the case; a hands-on commander in chief who, as soldiers and sailors watched in amazement, commandeered a boat and ordered an attack on Confederate shore batteries at the tip of the Virginia peninsula; a man who struggled with the immorality of slavery and as president acted publicly and privately to outlaw it forever; and finally, a president involved in a religious odyssey who wrote, for his own eyes only, a profound meditation on “the will of God” in the Civil War that would become the basis of his finest address. Most enlightening, the Abraham Lincoln who comes into focus in this stellar narrative is a person of intellectual curiosity, comfortable with ambiguity, unafraid to “think anew and act anew.” A transcendent, sweeping, passionately written biography that greatly expands our knowledge and understanding of its subject, A. Lincoln will engage a whole new generation of Americans. It is poised to shed a profound light on our greatest president just as America commemorates the bicentennial of his birth. About the Author: Ronald C. White, Jr., is the author of two bestselling books on Abraham Lincoln: The Eloquent President and Lincoln’s Greatest Speech, a New York Times Notable Book. White earned his Ph.D. at Princeton and has lectured on Lincoln at hundreds of universities and organizations, and at Gettysburg and the White House. He is a Fellow at the Huntington Library and a Visiting Professor of History at UCLA. He lives with his wife, Cynthia, in La Cañada, California. But he also harbored grave doubts about the intellectual capacity of African Americans, publicly used the n-word until at least 1862, enjoyed "darky" jokes and black-faced minstrel shows, and long favored permanent racial segregation and the voluntary "colonization" of freed slaves in Africa, the Caribbean, or South America. In this book--the first complete collection of Lincoln's important writings on both race and slavery--readers can explore these contradictions through Lincoln's own words. Acclaimed Harvard scholar and documentary filmmaker Henry Louis Gates, Jr., presents the full range of Lincoln's views, gathered from his private letters, speeches, official documents, and even race jokes, arranged chronologically from the late 1830s to the 1860s. Complete with definitive texts, rich historical notes, and Gates's original introduction, this book charts the progress of a war within Lincoln himself. We witness his struggles with conflicting aims and ideas--a hatred of slavery and a belief in the political equality of all men, but also anti-black prejudices and a determination to preserve the Union even at the cost of preserving slavery. We also watch the evolution of his racial views, especially in reaction to the heroic fighting of black Union troops. At turns inspiring and disturbing, Lincoln on Race and Slavery is indispensable for understanding what Lincoln's views meant for his generation--and what they mean for our own.